The historic centre of Essaouira consists of a maze of narrow alleys and ancient houses and is surrrounded by the imposing city walls. The area has been settled since prehistoric times, but the current city was built in the 18th century under the reign of Mohammed III, who employed European architects and technicians. 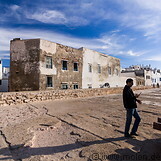 Nowadays the Medina of Essaouira consists to a large extent of souvenir shops, cafes adn restaurants, who cater to the large number of tourists who come to visit the city.